The grapes are finally READY!!! Join us for a very fun day -- rain or shine! 11am - Champagne brunch at the winery -- our thanks to you! We are going to be harvesting Saturday, September 8, at 7am (yes, that is AM). We need to harvest before the grapes get heated up for the day. We know it is early, but we will make it worth your while. We promise you a day you will remember fondly! Take I-44 (H.E. Bailey Turnpike) to exit 62 (Cyril/Fletcher exit). Head north on Whitfield Road (left at the end of the ramp). Whitfield Road will eventually turn west and intersect with Rt. 277. Go south (left) on Rt. 277 for 1 mile to E. 1480 Rd. Turn east (left) onto E. 1480 Rd. Road narrows to one lane of gravel. You will see the farm straight ahead. Drive is marked "Kaiser Lane." Total drive is about 10 minutes off the highway. Take I-44 (H.E. Bailey Turnpike) to exit 53 (Elgin exit). Head east (right) on Rt. 277. Technically, you're on 277 N, but the road is going due east at this point. Stay on 277, which turns north shortly. When you pass the Comanche-Caddo County Line, which is about 6 miles, you'll take the next right (east) on E. 1480 Rd. Road narrows to one lane of gravel. You will see the farm straight ahead. Drive is marked "Kaiser Lane." Total drive is 17 minutes off the highway. One of our super-helpful volunteers! Thanks, Raven! Lots of helpful, young volunteers! It is a very easy 20 mile drive to the winery from our Cyril Vineyards (also known as Forbidden Fruits Farm). 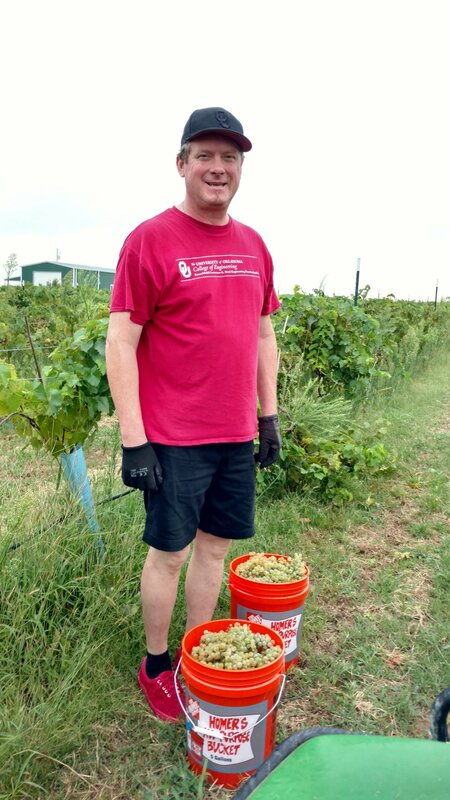 Depending on the harvest, we may ask volunteers to help transport the grapes (in buckets). If you have a pick-up or SUV, we'd appreciate your help transporting the grapes. When we get to the winery, volunteers who helped harvest will be treated to a delicious brunch farm-to-table style! If you can't get out of bed in time to help with the harvest, you are still welcome to come stomp grapes. Because the sky opened up as soon as we finished the harvest, we served brunch in the dining room! 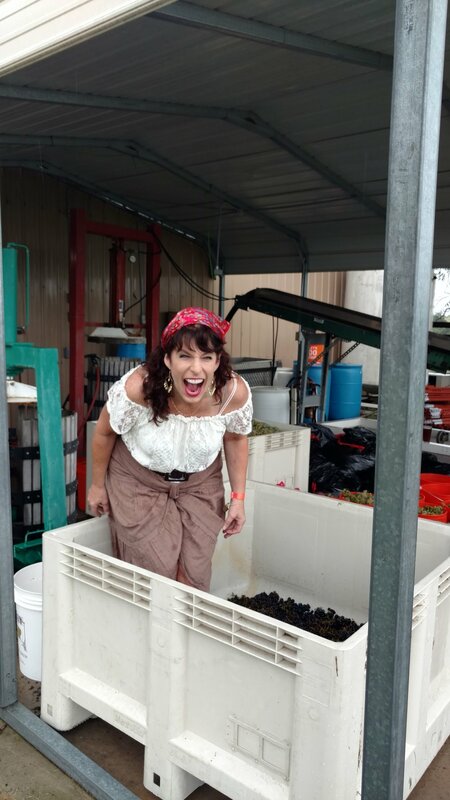 Get in on the fun and help us crush the grapes! We will have a costume contest, as well! Our guest who makes the most authentic I Love Lucy will win a bottle of wine! We can assure you that you won't be the only one there taking photos for this year's Christmas card! As you can see, children are welcome! 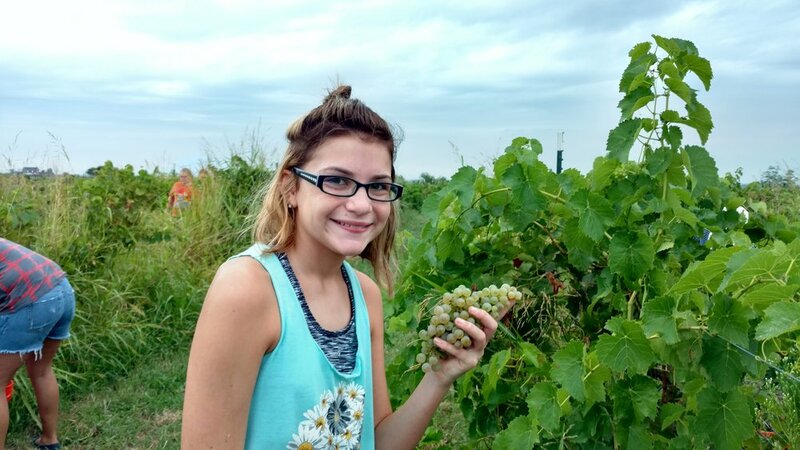 We had many children last year, and they made great grape-harvesters! As long as you trust them with scissors, they can help. Anne from Tulsa won the "I love lucy!" look-alike contest! We need a few strong young men to help with loading and unloading grapes. This is a paid job. These helpers won't need to help harvest, but they will need to be able to help move the grapes and juice around for the winemaker. We'll provide the work clothing (a toga). We'll also feed them well. Please call or text Alexis 405-247-3000 to interview and for details. Questions? Of course you have questions!!! Give us a call at 405-247-3000 with questions or to RSVP. Are you seeing this late on Friday night, wondering if you can still participate? Text Alexis at 405-247-3000 and let her know you are coming with your name, and how many people you have in your group. All are welcome! Please bring a hat and garden shears.